My husband, as part of his mid-life rediscovery, decided last fall to attend a weeklong sailing school. 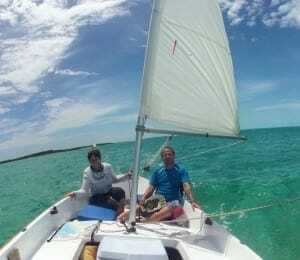 To entice me to enter the sport, he then signed us up for an ASA Flotilla to the Exuma Islands in the Bahamas. Knowing how much I love the outdoors, camping, and snorkeling/scuba diving, he saw this as an opportunity to combine his new passion, sailing, with the things I love. I knew nothing about sailing, and my only sailing “experience” had been as a passenger on a 4 mast, 440 foot long sailing cruise ship. We sailors arrived in George Town and were met by Dallas, owner of Out-Island Explorers, and our guide for the week. At our welcome dinner that evening, we met the rest of our crew – Brenda from ASA, and our two assistant guides, Chris and Anita. The next morning, with all our gear transferred from suitcases to dry bags, we were whisked away to the north end of Great Exuma, where we saw our little 21 foot Sea Pearls for the first time. From this point on, our adventure took place on the turquoise waters of the Caribbean. Our boats were laden with gear, food and libations were stored, and last minute details were settled. Our two Sea Pearls took us out of the tiny harbor of Barraterre for a very short sail to Rat Cay – just 20 minutes or so – to familiarize everyone with the boats and the use of lee boards: something new to all our sailors. 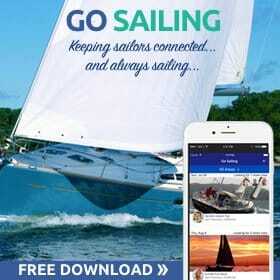 Being my first time in a real sailboat, I learned what close-hauled sailing, and heeling, was firsthand. In a small boat, heeling can be very scary the first time, but I soon learned to enjoy it. We then headed downwind to Norman’s Pond Key. We practiced wing-on-wing sailing: in this case it was slower than a deep broad reach. After successfully tacking to the sandy beach, and being thankful that the leeboard configuration allowed us to sail in shallow water all the way to the shore, we affectionately named our campsite “Three Palms.” We set up our tents under shady palm trees, shared a celebratory drink for our first day, and told tall tales of our sailing experience. With a total sailing distance of 7 miles, and 1 1/2 hours, it was a great beginning. The next morning screeching seagulls started our day early. The boats were reloaded, and we checked out the charts to plot our course for the day. We headed to Lignonvitae Cay to lunch, then to Big Farmer’s Cay for two nights of camping. Another 3 1/2 hours of sailing experience for all. 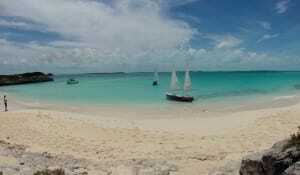 At Big Farmer’s Cay, everyone got to practice sailing skills in the shallow sandy flats in front of our campsite. Brenda gave me some basic sailing lessons, using the sandy beach and a stick as our chalkboard and chalk. 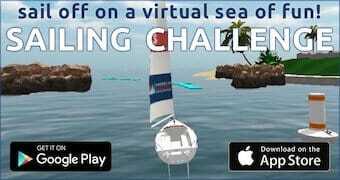 Then she took me out on the sailboat and had me tack back and forth until I was dizzy! Back on shore, over evening libations, our discussion led to the difference between training and sailing in a flotilla. Training teaches you the fundamentals through repeated practice, and when you’re sailing long distances for fun, such as in a flotilla, you use that training to execute certain maneuvers, such as tacking and jibing, efficiently when you need to. Our next campsite was Gaulin Cay South, about 8 miles or three hours downwind from our previous campsite. Getting into our campsite was a bit tricky, as the beach was just past the strong ocean currents coming in from the Dotham Cut. At this point, our sailors were becoming experts at handling the little Sea Pearls, and handled the challenge well. Again, we spent two nights here – all of us were grateful that we were spared having to tear down camp every morning. On our “free” day here, Dallas took all of us on an exhilarating tour in his powerboat so that we could see highlights of the Exumas far north of where we would be sailing. Seeing the private island and yacht of everyone’s favorite current day pirate (Captain Jack Sparrow/Johnny Depp) were the highlights. Every day there were opportunities to enjoy the best of the Exumas and it’s abundant wildlife. We were able to get into our snorkel gear at least once daily (sometimes 3 or 4 times) and see colorful reef fish living below our sailboats. Little lemon sharks and stingrays would visit the waters near our campsites, and we had more than one sea turtle sighting enroute. We hiked into a cave, snorkeled in other caves, and fed the swimming pigs. At one campsite, we even set up our tents under the watchful eyes of dozens of iguanas. 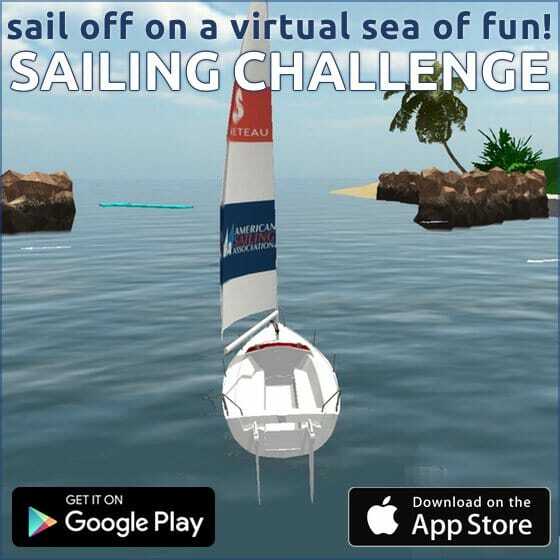 This was much more than just sailing: it was adventure! Even inclement weather could not dampen the enthusiasm of our sailors. During an afternoon of heavy pouring rain, our assistant guide Chris cut small shavings of wood from the dry inner part of wet firewood to start a small fire. How wise he was to start this fire on a large board– as he added more wood and the fire took hold, he was able to move the fire out from under the fly. Meanwhile, we sailors sat in dry comfort. On our last morning, we woke up to totally calm weather – no wind. Our take-out point was only 2 or 3 miles away in Staniel Cay, but it took almost that many hours to get there. With no motor to help us out, our “running” was slower than a peg-legged pirate’s walk! Eventually, we arrived at our beach site, helped to disassemble the masts from the Sea Pearls, and had our final lunch together. Then we found our wonderful hot showers and comfortable beds before a celebratory final dinner. 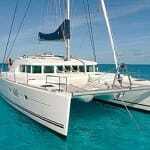 Join us on next year’s Exuma Flotilla, April 12-19th, 2014. For more info, visit www.asa.com. Okay, that does it. You’ve TOTALLY inspired me to sign up for the week-long class. 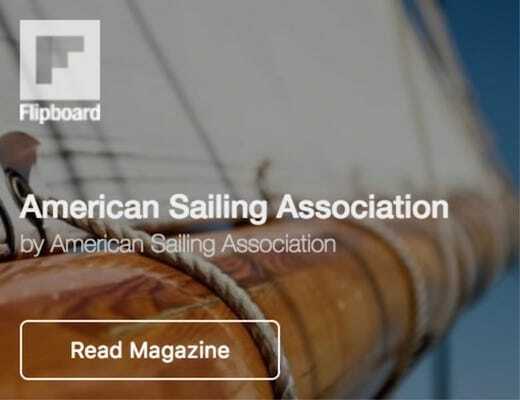 I’m currently a member of the Lanier sailing club (ASA) in Pensacola and have a great time on the 22’s and 25 footer, but this piece has really got me ready to head down yonder for a true adventure. That’s great to hear. You’ll love it! The trip really was a wonderful experience. If you can — GO!! It is so worthwhile.